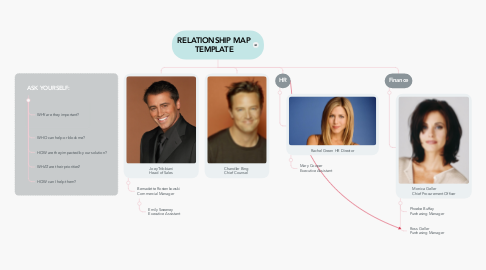 Use this mind map to create your relationship map. Colour code based on relationship strenght, use lines to connect relationships and notes for details on your plan. Send to MeisterTask for complete project management. 7.1. WHY are they important? 7.2. WHO can help or block me? 7.3. HOW are they impacted by our solution? 7.4. WHAT needs to change? 7.5. HOW will I make change happen?